I just lost the love of my life, my Charlie, a toy poodle that lived for 13 years! As a member of the family filled with so many dogs, age has set in and many of our pets are getting up there. My baby sister has 4 dogs, Dad has 5 with 2 very ill right now, my middle sister lost her Yorkie last year, and my sister-in-law had 5 German Shepherds, 2 fell ill and past. 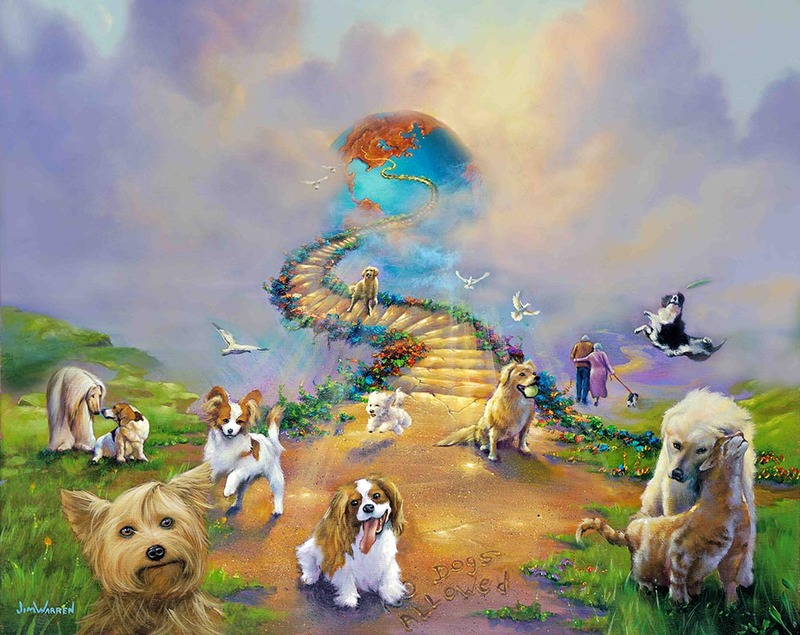 This painting certainly represents what we hope and pray that “All Dog’s Go to Heaven” and they are blessed with much love. Thank you for painting such a beautiful painting. I wish I could have this hanging in my home. Bless you. It is a beautiful ! The memories to my dog George ! I am so proud that I got this pantin! Beautiful, just amazing! Thank you so much for sharing your talent. This is so beautiful. My dog Walter, just went to heaven. I would love to have a copy of this. Absolutely beautiful. Would like see more about animals. Especially dogs and cats and wolfs. Such a beautiful picture…So good knowing that others feel the same way as I do.. That is that all dogs go to Heaven..I love my little Maddie…. How much is your print for All Pets go to heaven?? I love your work, it touches my soul as through the years I’ve lost dogs and cats whom I still love to this very day. I look forward to seeing them one Day in heaven. I would love to have these prints if possible. Inquiring on prices I have lots of clients and some are so very special and for myself been working with animals 17 years what are your prints cost thank you for your beautiful work god gave you this beautiful talent! Absolutely beautiful. My dog of 15 years passed away on May 5, 2015. He was like my son, my best friend. I love this picture and it helps to see this picture for my healing. These paintings are incredible. We just lost our terrier. When I came across all dogs go to heaven I could not believe the gift God blessed you with. Your pictures are simply beautiful and so lifelike. I just lost my beautiful Yorkie 3weeks ago and it broke my heart .I would love to have to have the “All dogs go to heaven “4Soft Soft Sky”. Can you give me the price of it and let me know where to order it at. Thank you for such beautiful art. a family member as all others members of the family , i wrote him a poem (in french) when he passed by..